after realizing that this recently ordered cardigan came with an unwanted accessory -a plastic security tag! -i popped into my local j.crew store on monday to have it removed. with the afternoon at my disposal, i opted to stay and peruse a few goodies from the brand’s latest collection. 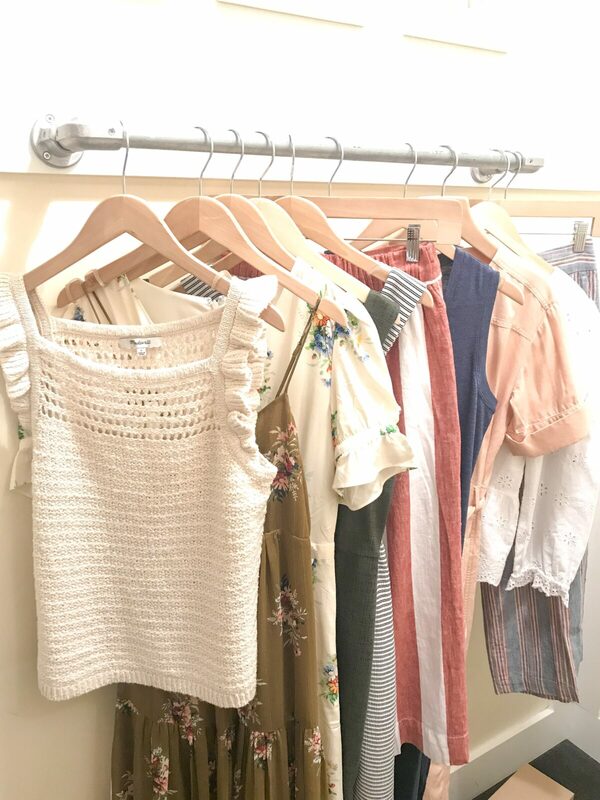 let’s just say i ended up in the dressing room with more than “just a few” pieces. whoopsies. i’ll have you know that while i left empty-handed, i’m feeling very inspired by [hopefully] what’s to come from the brand not only later in the season, but more importantly (as it’s one of my favorite times of year for fashion) into the holiday season. as always, below are my honest opinions about style, quality, and fit! 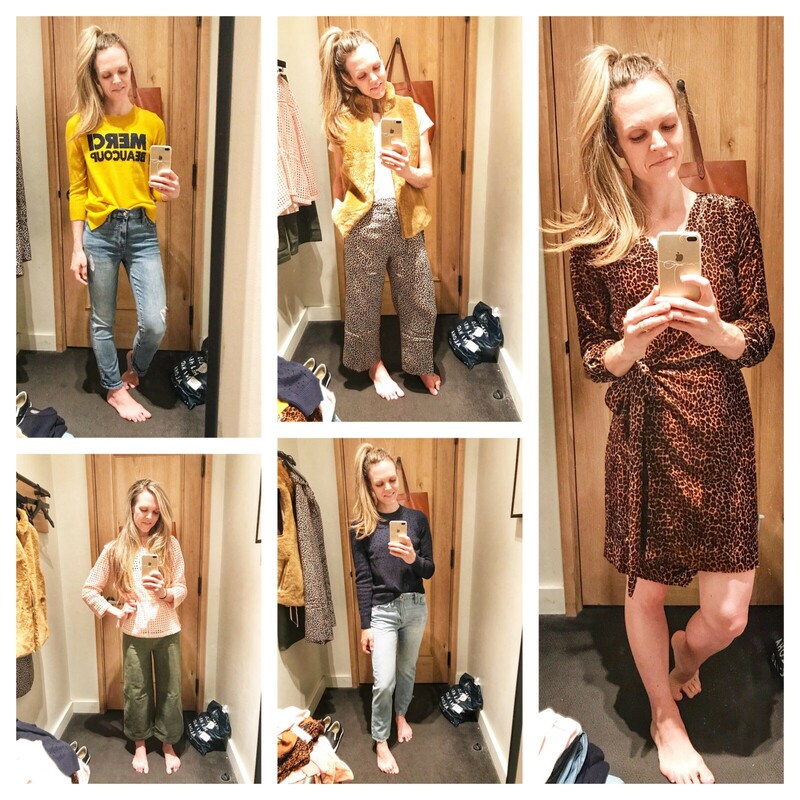 i’ve also linked my try-on videos to the “shopping” highlight in my instagram profile. point sur eyelet top (small) || given my love of eyelet, it’s no surprise that i carried this top into the dressing room with me. the victorian collar reminds me a lot of the madewell blouse i picked up last week. for that reason, i couldn’t justify snagging this similar style, but it is a beautiful piece that would easily transition into fall. unlike some of the eyelet tops i already own, j.crew’s version comes with a camisole attached making it also work-appropriate. i also loved the tie-detail at the waist, perfect for cinching in the extra fabric to create an hourglass silhouette. besides the subtle pink, the top also comes in black and ivory. i’d pair it with skinny jeans and a velvet flat for a perfect transitional outfit from summer to fall. point sur washed wide-leg crop (26) || if a store has a wide-leg cropped pant, there’s a HIGH probability that i will try it on. i couldn’t resist seeing how the point sur version stacked up against my beloved everlane style as well as madewell’s emmett pant. if the winner of the three received a medal, i have to say j.crew’s wide-leg crop would claim the bronze. while the fit was flattering, the fabric felt cheap and stiff. ironically, it’s the most expensive of the three pairs at just under $90.00. 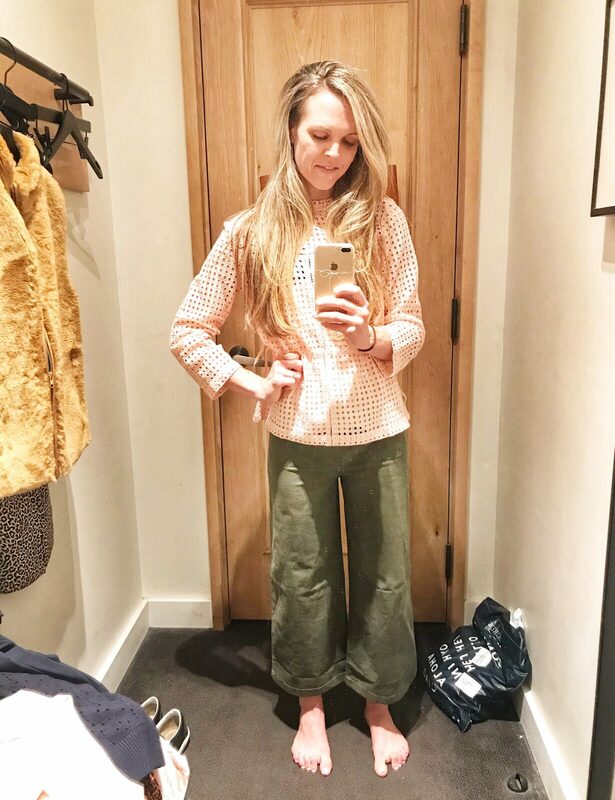 if you’re looking to jump on the wide-leg crop pant train, i still stand by my recommendation of everlane’s tried and true option not only for the fit and fabric quality, but because you really can’t beat the price of $68.00. size verdict: pretty true to size, runs a little big in the waist. *as i mentioned in my video, these pieces are certainly not ones i’d normally pair together, but i wanted to at least get them on to assess their quality and fit. mercantile broken-in t-shirt (small) || in all honesty, i grabbed this tee so i would have something to pair with the leopard pants, but it’s really quite comfortable. j.crew introduced its mercantile collection last year offering pieces at a more affordable price point. these tees are priced at under $15.00 making them a steal for a quality wardrobe staple (don’t forget j.crew is always having a sale!). they also come in just about every color of the rainbow. plush fleece excursion vest (small) || living in san diego, there are a lot of outerwear pieces i simply cannot justify adding to my closet. a fleece vest is certainly one of them (although i do own this puffer vest that gets worn maybe once a year?). however if you live somewhere that gets cooler than say 60-degrees in the fall/winter, this vest if beautiful and so so soft. i’m partial to the camel color (called golden hickory) but it also comes in wine color and black. layer it over your favorite plaid, jeans, and boots and grab yourself a pumpkin spice latte and you’re the definition of fall. 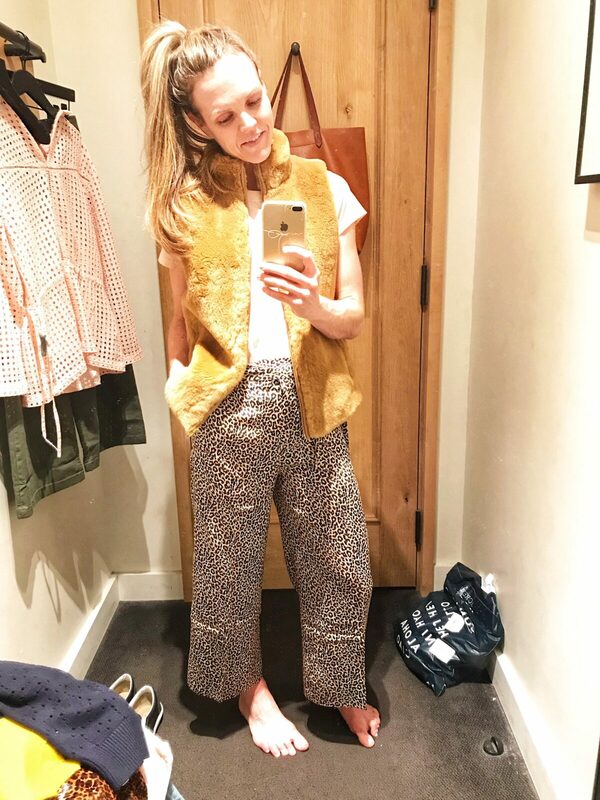 wide-leg cropped pant in leopard-print silk (2) || i shared on instagram on monday that i’ve never been too keen on leopard print, yet here i am trying on two festively feline garments. i will say, leopard does feel appropriate for the fall (and even into the holidays). i wanted to love at least the fit of these pants (given my love for everything wide-leg cropped), but even that was a miss for me. silk is tough guys and if it doesn’t fit impeccably, it has a tendency to look messy. and that’s exactly what these pants were –messy; too big in the waist, yet kind of tight in the thighs/seat and overall simply unflattering. it’s a shame though because i loved the tie-waist detail and if i was still commuting to a corporate job, they’d be great for the office paired with a black pump and cashmere sweater. size verdict: true to size. though they ran big in the waist, they were tighter in the hips/seat, so for that reason, i’d avoid sizing down. point sur allover pointelle crewneck sweater (small) || i think of everything i tried on, this sweater was my favorite piece. i sound like a broken record with my love for the point sur collection, but j.crew really nailed it with its introduction this year. honestly the weight of this sweater surprised me in the best way -it’s a lot thicker than it appears, especially given its pointelle detail. for that reason, it’s the ideal summer to fall transitional piece. wear it without an extra layer underneath now and then pair it with a camisole and a denim jacket as the temperatures dip. turns out i’m not the only one who is smitten with the cotton knit -it’s nearly sold out in all of the available colors. looks like the ivory and navy are still available at the store and online but make sure you act quickly! point sur high-rise retro straight jean (25) || as you know, i’ve been really eyeing j.crew’s denim collection lately so i couldn’t make it out of the store without trying on a couple pairs from the point sur collection. i took a gamble and sized down in this straight leg pair and i’m glad i did because they definitely run big. 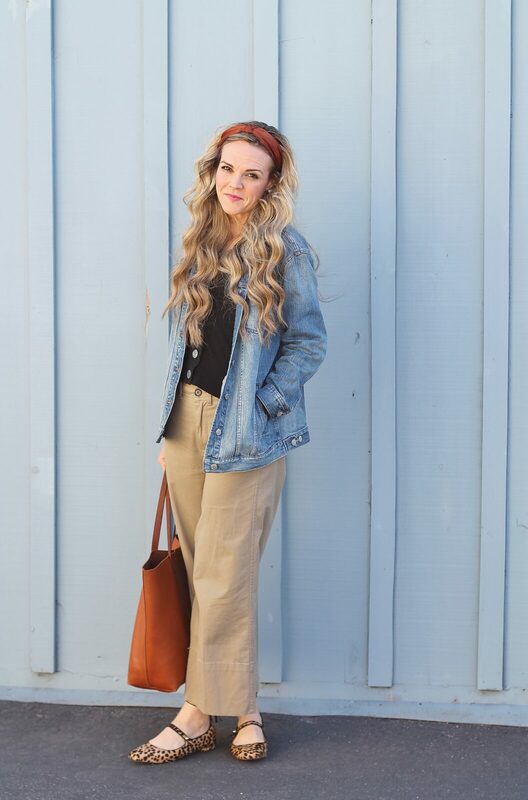 honestly these jeans are nearly identical to madewell’s perfect summer jean (they’re even the same price!). 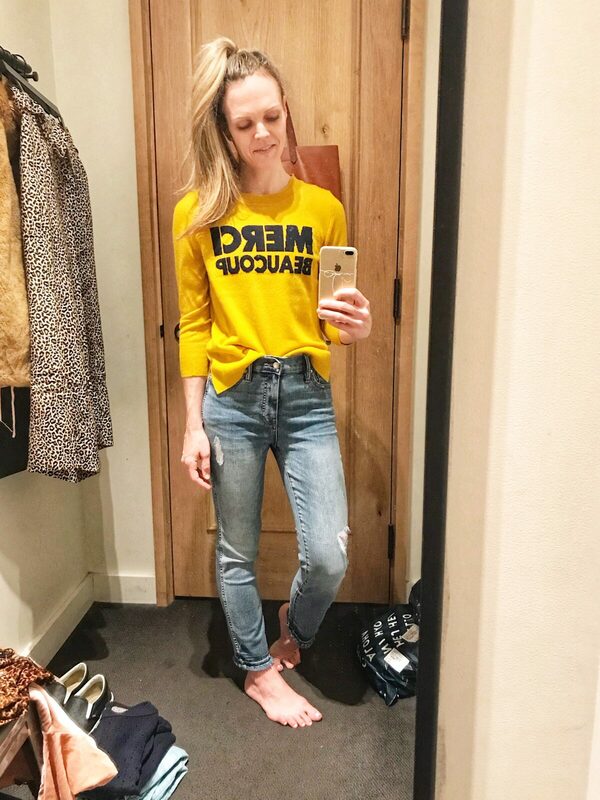 unfortunately for me, those jeans stretched out a crazy amount, so much so that i ended up donating them back to madewell through their denim recycling program. i think the straight-leg silhouette just isn’t the best one for me. however if it is a favorite of yours, this pair has a nice high-waist and little stretch -reminiscent of a vintage levi’s style. just make sure you size down! size verdict: runs big, size down one size. everyday cashmere crewneck sweater with “merci beaucoup” (small) || i don’t usually go for “message tees” (or in this case, a “message sweater”) but i love most things associated with french culture so i couldn’t help but grab this sweater for a try-on. i was particularly excited that this charming cashmere knit was also in my favorite hue. however, upon further inspection (since my only exposure to the sweater was seeing it online), i realized that the sweater isn’t mustard but rather more of a marigold or canary shade of yellow. to my dismay, those subtle ranges in the color spectrum were enough to garner it unflattering. the 3/4 length sleeve also didn’t help the cause (i have a deep aversion to the 3/4 sleeve). i will say that since it’s cashmere, it is extremely soft and of course, the merci beaucoup (translated to “thank you very much”) across the front is an adorable touch. size verdict: runs small, i would size up for a blousier fit. point sur hightower straight jean (26) || unlike the retro jeans, this style of point sur denim had a lot of stretch. of the two pairs, i liked this one more -especially with its subtle distressing and let-down hem. i stayed true to size in this style and they seemed to fit pretty well (albethey a bit gappy in the waist). the rise is 10″ so they’re pretty high but for me, the higher the rise the better ;). like i mentioned above, i think i’ve given up on the straight leg silhouette but overall these are a good option for those wanting an alternative to their normal skinny or wide-leg styles. 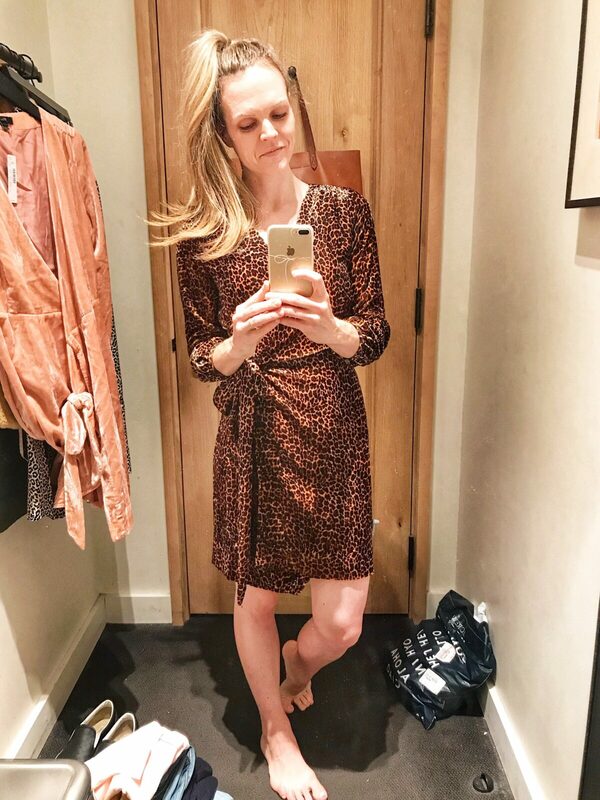 wrap dress in drapey velvet blush leopard (0) || much like leopard, i feel like velvet makes its triumphant return around this time of year. 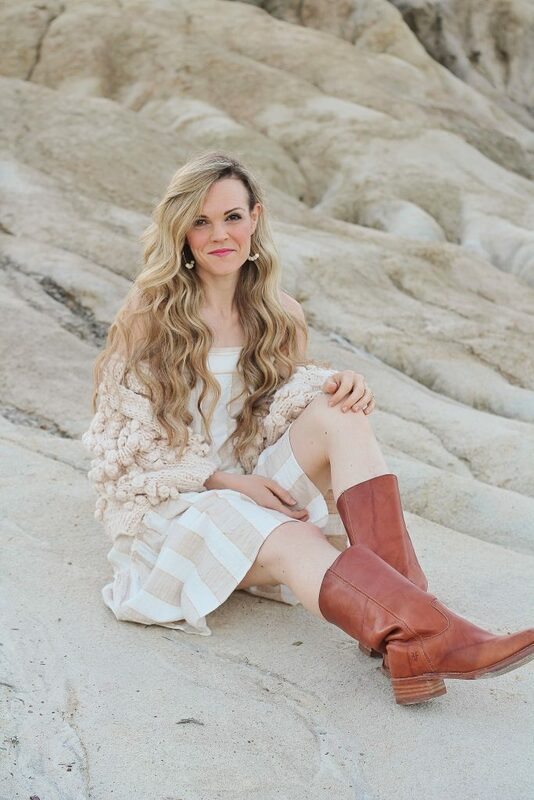 as luck would have it –this dress incorporates both seasonal trends. i’m not usually one for wrap dresses, but i was curious to see how this dress looked off the hanger so i took a gamble and tried it on. i’m usually a 2 in most things at the store but it wasn’t available so i grabbed the next size down and hoped for the best. surprisingly, i think you’d be safe in either your true size or a size smaller since i can’t imagine much of a difference between the two. i will say that the neckline is a generous v (i’m strategically covering it up with my phone in this shot mostly because my navy blue sports bra was exposed) so if you’re on the bustier side, i might stay in your regular size. questionable fit aside, i liked this dress more than i thought i would. it’s definitely not my style, but on the right person, it would be adorable worn throughout the fall and straight into the holidays. 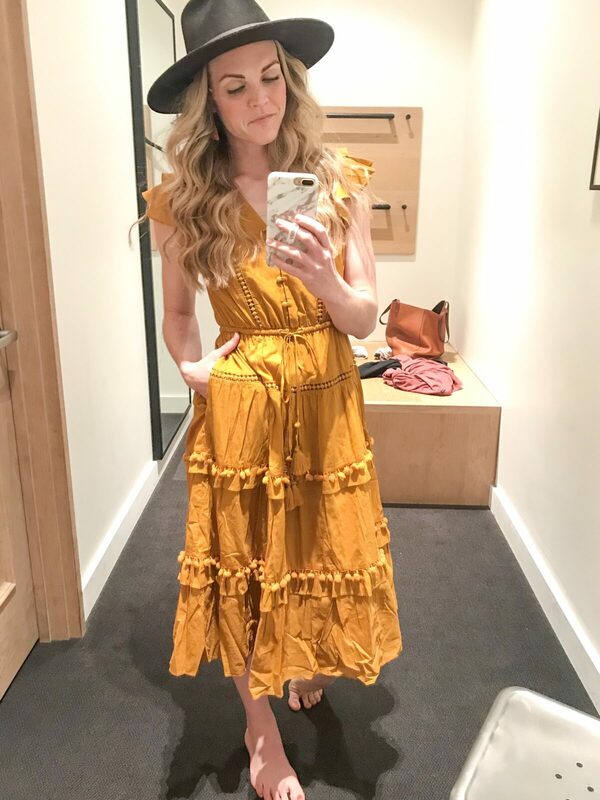 i’d pair it many different ways -with leather booties or over-the-knee boots for a more casual look or with tights and block heels and a bow ribbon in my hair for a feminine party ensemble. if leopard isn’t your thing, the dress also comes in grey, blush pink, and navy. size verdict: try your normal size and one size down to solidify the right fit for you!